We’d love your help. 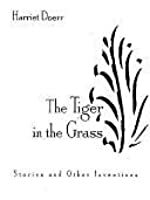 Let us know what’s wrong with this preview of The Tiger in the Grass by Harriet Doerr. 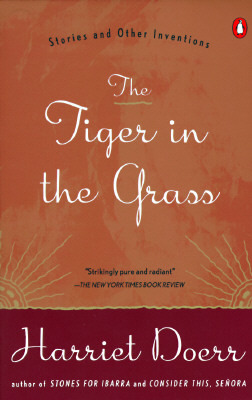 To ask other readers questions about The Tiger in the Grass, please sign up. Despite the collections beguiling sweetness, I find her writing, albeit enjoyable, contrary to my taste and expectations. Some of the stories have a wandering quality as if she didn´t wish to be overly pointed in her observations but offhandedly remark on her experiences and perceptions. This lent the collection an airy, ethereal quality but confusing as to the point of the story. Perhaps the ambiguity makes for? What a sense for language! I recall that I previously read Stones for Ibarra and like it - but did not flip over it. But this book, while taking us back to Ibarra in some of the short stories (and to other places in Mexico in many others) really hits me differently. Perhaps I have changed and am not more sensitive to beauty in prose than before. In any case, there is beauty in this short read. I particularly liked the final sections. Can't stop thinking about this. So glad daughter-in-law Karen shared the same enthusiasm when I was finishing it. Doerr's prose imagery is lasting and spawning of more and more thoughts. Audio version on a road trip. We read this delightful book of short pieces for our book club. Her writing is an opening onto a beautifully felt and realized world of sight, smell, touch and feeling. Her writing is simple and graceful. It is like reading poetry. Doerr’s title and the first story in this collection comes from a visit to her optometrist. She was in her 80’s and she was hoping aloud that she didn’t lose sight in her right eye as she only had peripheral vision in her left. The doctor responded, “Don’t belittle peripheral vision. That’s how we see the tiger in the grass…It’s also how the tiger sees us.” And she knew then, that she had always known this tiger in the grass, but never had a name for him. The vision seems to follow us throughout Doerr’s title and the first story in this collection comes from a visit to her optometrist. She was in her 80’s and she was hoping aloud that she didn’t lose sight in her right eye as she only had peripheral vision in her left. The doctor responded, “Don’t belittle peripheral vision. 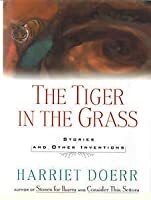 That’s how we see the tiger in the grass…It’s also how the tiger sees us.” And she knew then, that she had always known this tiger in the grass, but never had a name for him. The vision seems to follow us throughout the stories she presents in this volume. The stories are written late in life, when on her 85th birthday her dying son reminds her that she needs to write her memories. As her son is dying she reflects so starkly what all mother’s must reflect in their heart of hearts not only about their children, but our reponses to them as our planet tilts beyond our grasp. The rest of the stories are a combination of the enchanted and the beautiful as witnessed in her life or her imagination. In them it is easy to see that Harriet Doerr is haunted by Mexico. She writes in variations on the theme of her Mexico experience. She writes in the harmonies of chamber music, where each chord is clear, resonant and carves out the lay of the land, the sound of the people, a profusion and preciousness of wildflowers. She captures in a tender way the dichotomy of her life in contrast to the indigenous population. There is no sonorous pathos accompanying her contrasts, but quiet observation; sometimes tragic evolutions, often wry appreciation. Harriet Doerr wrote two novels and this book of short stories. One could read her total works over a weekend. This is one of those authors that I really cannot say why I love their writing, except for the sense of place. You can just see the Mexico that she describes. Fine example of "visual writing," with memorable imagery increasing the stories' emotional impact. In one of the pieces in this book—hard to know where the fictional begins and the autobiographical ends—the author writes, “I think of what it is like to write stories. It is a completion. It is discovering something you didn’t know you’d lost. It is finding an answer to a question you never asked.” All the stories contain answers but few punch lines; the point is to be found somewhere else, buried. These are tales told with some subtlety and charm, two words that probably felt they’d fun out of In one of the pieces in this book—hard to know where the fictional begins and the autobiographical ends—the author writes, “I think of what it is like to write stories. It is a completion. It is discovering something you didn’t know you’d lost. It is finding an answer to a question you never asked.” All the stories contain answers but few punch lines; the point is to be found somewhere else, buried. These are tales told with some subtlety and charm, two words that probably felt they’d fun out of mileage some years ago but they’re hanging in there. One reviewer on Amazon said, “This collection of short stories feels like a lot of snippets that she didn't know where to fit into her novels.” She still gave the collection four stars so I don’t think the mark was intended to be disparaging but it does say something about the general tone of the pieces; the points they make are not grand but there to make you think. Mexico features prominently in the collection and the stories are paced accordingly; none is in a rush to get anywhere and she’s fond of describing everything. Which she does beautifully—she never puts a foot wrong—but, personally, I found most of the stories dragged their feet and she struggled to hold my attention. I was, frankly, puzzled by the five-star reviews especially when Kirkus Review describes these as, “Largely forgettable short works by the acclaimed author of the Mexico-set Stones for Ibarra (published in 1984, when Doerr was 73) and Consider This, Señora (1993). […] It seems fair to say that this fragile volume wasn't subjected to very rigorous editing, and that much of its content need not have been preserved.” I’m afraid I have to agree with them. I wanted to like this and some of it I did. There were some touching moments like in the title story where a mother whose son is now dying of cancer remembers that his first word was ‘car’ and he’s now just been informed that he can no longer drive. My son called to say he was dying. He had fallen down and couldn’t get up. I think of what it is like to write stories. It is a completion. It is discovering something you didn’t know you’d lost. It is finding an answer to a question you never asked. If all the stories had been of a similar standard to the opening one I would’ve been more generous with my stars but, sadly, they were not. A remarkable book. I've been reading sections to everyone I know for the last two weeks, starting on the walk home from the library. I was looking for a book by Anthony Doerr and saw this 2005 hardback version by the author of Stones from Ibarra (a huge favorite of mine from the 80's). Well, from the first sentence I was in Doerr's hands/written words...I have read the first two pages to at least 15 people, especially my seniors, "Yesterday was my 85th birthday..." Then I show the students her b A remarkable book. I've been reading sections to everyone I know for the last two weeks, starting on the walk home from the library. I was looking for a book by Anthony Doerr and saw this 2005 hardback version by the author of Stones from Ibarra (a huge favorite of mine from the 80's). Well, from the first sentence I was in Doerr's hands/written words...I have read the first two pages to at least 15 people, especially my seniors, "Yesterday was my 85th birthday..." Then I show the students her brief account of a long life, about 30 pages. If they let me I also read them from the 4th section on Memories, "Sleeves of Rain." Doerr's "stories and other inventions" are the work of a great writer and one who makes it easy for me to show students what can be done using simple techniques (narrowing memories into categories, like homes lived in...) Particularly the personal pieces are great teaching examples of memoir writing. In between are stories, mostly from the Mexico years, similar to the characters we have met in Stones for Ibarra and Consider This, Senora. Of these stories I will say that Mexico can be very harsh. Her writing is always spare and yet lovely, but I wish I had not read the story "Saint's Day." Too painful. Just don't go there. This is a book you never want to finish. As you come closer to the end, you find yourself reading more and more slowly. Then, when you do finish, you feel like starting again at the beginning. Harriet Doerr writes so tenderly with such evocative prose and economy of language that you lose yourself in it. Each of these stories and "inventions", polished by memory, is a gem. Written for a son who was dying of cancer, it was to be a brief account of her long life. The title comes from a conversation This is a book you never want to finish. As you come closer to the end, you find yourself reading more and more slowly. Then, when you do finish, you feel like starting again at the beginning. Harriet Doerr writes beautifully intimate portraits of family in this collection of her stories. I felt as if I was in the room watching these people. Her love of the sea comes through the characters as well. She reminds us of the constantness of people's lives and how we are on this planet for such a short time and we never know what life will bring for us. There is a temperate sadness in her words and a triumph of lives lived on and on doing the best we can. A selection of short stories and vignettes and essays that Doerr wrote at various times during her career. They are good but not as good as her book Stones for Ibarra. I like the way she plays with the language where she seems to think of a theme and then writes about it. There are remembrances from her days in early California along the beach before it became the Mecca that it is today. Memories of Mexico where she lived for a number of years. Good writing but not great. This book is a combination of memories and stories and presumably their intersection. And it is, like Doerr's other works, simply marvelous. Set in Mexico and California in the 20th century, her work looks for beauty in people and in places and she finds it where the rest of us might not. She gentles raging emotions and moves us toward peace, for her characters, and by example, perhaps for ourselves. She started publishing late in life and her body of work is small. READ IT ALL. Doerr was a fabulous writer; an inspiration to those of us who have come to writing later in life. This book is packed with sentiment, powerful images and a voice that whispers in your ear. Wonderful. I listened to this book on tape and since the chapters were all jumbled, I listened to some twice. Eventually I decided I could not keep all female characters apart, and since most, or perhaps, all stories dealt with life in Mexico, I also could not keep the stories apart. Abandonment followed. Harriett Doerr is a wonderful writer. These are short stories and they are beautiful. Very well written. Quite touching. It drove me crazy to be pulled into a story only to have it end without no closure given. A short story collection, beautiful prose but I couldn't connect with the stories- they didn't really seem to go anywhere. . . The author is quite inspiring - she was first published quite late in life. Her first book Stones for Ibarra won the National Book Award. Short stories from Harriet Doerr who writes with very simple, but elegant prose. I believe this was her last publication before her death. Harriet Doerr (April 8, 1910 – November 24, 2002) was an American author whose debut novel was published at the age of 74. A granddaughter of California railroad magnate and noted collector of art and rare books, Henry Edwards Huntington, Doerr grew up in a Pasadena, California, family that encouraged intellectual endeavors. She enrolled in Smith College in 1927, but transferred to Stanford Univers Harriet Doerr (April 8, 1910 – November 24, 2002) was an American author whose debut novel was published at the age of 74. A granddaughter of California railroad magnate and noted collector of art and rare books, Henry Edwards Huntington, Doerr grew up in a Pasadena, California, family that encouraged intellectual endeavors. She enrolled in Smith College in 1927, but transferred to Stanford University the following year. In 1930, after her junior year, she left school to marry Albert Doerr, Jr., a Stanford '30 graduate whom she had known in Pasadena. The Doerrs spent the next 25 years in Pasadena. Albert Doerr's family owned a copper mine in the Mexican state of Aguascalientes, and in the late 1950s, the Doerrs moved to Mexico where Albert was engaged in restoring the mine. They remained until 1972, when Albert died ten years after being diagnosed with leukemia. The time she spent in this small Mexican mining town would later provide her with the subject matter and settings for much of her writing. Following her husband's death, Harriet Doerr returned to California. At the suggestion of her son Michael, she decided to finish the education which had been interrupted so long before by her marriage. She enrolled once again at Stanford, and in 1977, received a BA in European history. While at Stanford she began writing and earned a Stegner Fellowship in 1979. She soon began publishing short stories. Her first novel Stones for Ibarra was published in 1984 and won that year's National Book Award for First Work of Fiction. Her second novel, Consider this, Senora, was published in 1993, and a collection of short stories and essays, Tiger in the Grass: Stories and other Inventions followed in 1995. A television adaptation of Stones for Ibarra was presented by Hallmark Hall of Fame in 1988.